The Fall 2018 academy runs from September 6 to November 15, 2018. 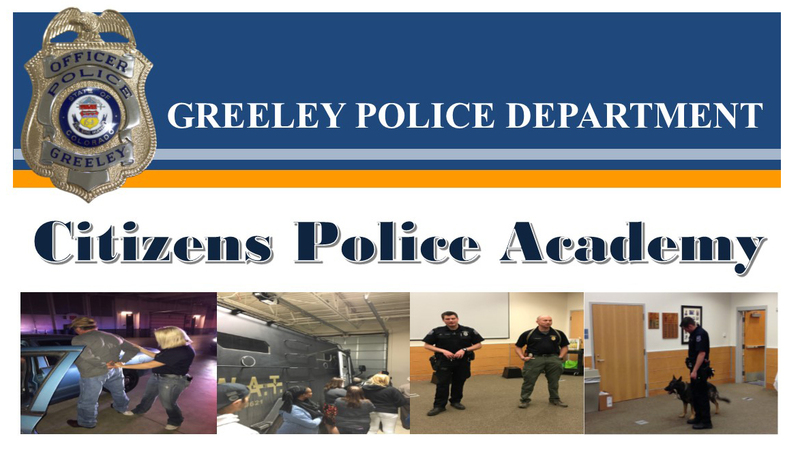 Classes are held on Thursday evenings at the Greeley Police Department, 2875 10th Street, from 6:00 p.m.— 9:00 p.m. Best of all, the class is free! The academy is limited to 25 participants. You must be at least 18 years of age and be a member of the Greeley community either as a resident, employer, or property owner. A background check will be completed on applicants prior to acceptance. Classes will be held at the Greeley Police Department, 2875 10th Street. On occasion the class location may change due to the topic of the week. Advance notification will be given when the class location changes. If you have special needs that require accommodation in order for you to participate in this program, please contact Sgt. Matt Patella at 970-351-5378 or PST Keith Andersen at keith.andersen@greeleypd.com.